We now offer Siser BlackBoard Heat Transfer Vinyl (HTV)! With this easy to cut and weed vinyl, you can turn fabric into a writable surface that can be used over and over again. This vinyl transforms plain apparel into a walking chalkboard. Use your cutter/plotter and custom-cut nearly any shape for any use! BlackBoard vinyl is compatible with hobby cutters such as Circuit, Sihouette Cameo, and Scan N Cut. This vinyl comes in 15″ wide rolls. However, you may need to trim it down to use in a hobby cutter. Additionally, it works great with commercial-grade cutters from Roland, Graphtec, and US Cutter. Siser BlackBoard is extremely easy to work with. It is only 90 Microns/3.5 Mils thick (which is the same thickness as regular Siser Easyweed HTV). First, create your design with vector art software. Second, cut your design with your cutter/plotter. Third, weed the excess material from you design. Finally, heat press your design onto your garment. You will get a smooth and consistent result compared to old traditional methods of using chalkboard paint, or thick, screen-printed ink. When you wear it, you will hardly feel it! Siser Blackboard HTV is lightweight and super soft. The vinyl only needs 275°F of heat with medium pressure for just 15 seconds to create a machine washable chalkboard! With a low application temperature and warm peel carrier, this HTV is ideal for heat sensitive materials such as polyester and tri-blends. Blackboard vinyl can be cut with 45 and 60 degree blades. It is not recommended to layer this vinyl. Siser Blackboard HTV is only available in the black. Siser BlackBoard vinyl compatible with standard chalk. It is easy to re-use as it is to apply. Simply wipe clean with a damp cloth to start again! Kids, adults, teachers, employees, volunteer groups, and more all can make great use of Siser BlackBoard HTV. Combine BlackBoard HTV with other specialty vinyl like Glitter and Flock to create a truly unique design. The possibilities are endless! There are countless ways to advertise and customize with BlackBoard heat transfer vinyl. 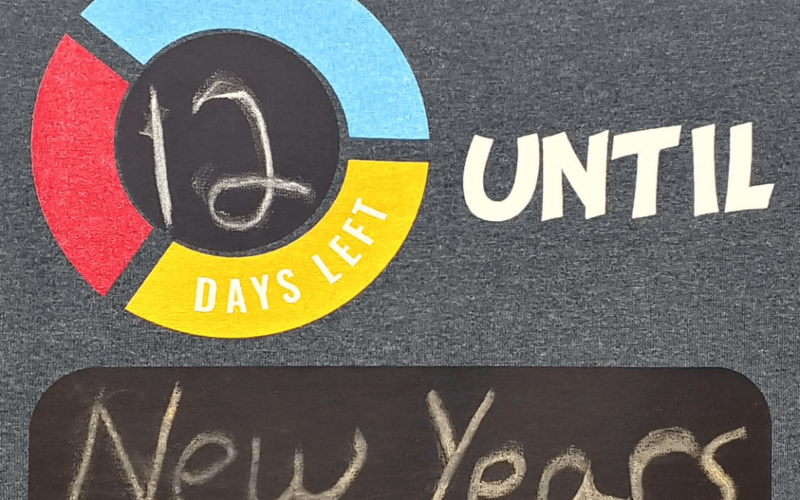 BlackBoard HTV can be used to make countdown shirts for major life events. For instance, birthdays, anniversaries, vacations, retirement, childbirth, holidays, weddings, concerts, last day of school, and more. BlackBoard vinyl is a great alternative to nametags. The vinyl won’t fall off like name stickers can when used on “reusable” or “temporary” shirts for events with volunteers and fundraising. Another great use for BlackBoard vinyl is for mood shirts. 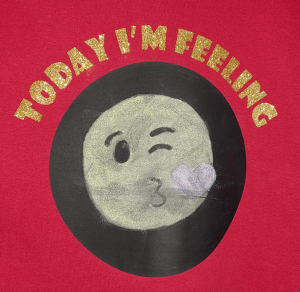 For instance, someone could have a shirt on which they draw a picture or write a word describing how they feel that day, without having to purchase a different shirt for each mood. Servers and bartenders could write daily specials on their shirts. Employees can advertise throughout the bar or restaurant in a unique way, instead of just having a sign in front of a restaurant. There are a few important things to know about applying Siser BlackBoard vinyl. For instance, BlackBoard vinyl can be applied with an iron, but a commercial heat press is recommended for better results. In addition, you can decorate 100% cotton, 100% polyester, and cotton/poly blends with Siser Blackboard vinyl. 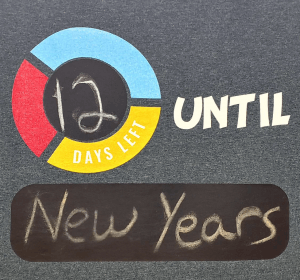 After that, it is advised to wait 24 hours after application to wash a garment printed with Siser Blackboard vinyl. Above all, Siser BlackBoard is CPSIA Certified so children’s apparel can be decorated with peace of mind. Check out our vinyl page for more information on the heat transfer vinyl we carry. We sell Siser Blackboard HTV online (for local Indianapolis pickup only) and in our shop (along with an assortment of several other types of heat transfer vinyl). Get started on your custom BlackBoard apparel project today! What unique design will you come up with?